The concentration camp at Majdanek seems to have been laid out by the Nazis with an eye toward its future use as a museum for tourists. The gas chambers are the first exhibit you see after exiting the documentary movie at the visitor's center. If I had not had a guide with me, I could easily have missed the gas chamber building. Unlike the impressive brick buildings which once housed the gas chambers at Auschwitz II, usually known as Birkenau, this building is a very ordinary wooden prefabricated horse barn set at right angles to, and only a few feet from, a row of wooden storage buildings outside the main barracks area of the camp. These storage buildings, which are identical to the barracks buildings, are where the museum exhibits are now located. The clothing taken from the Jews was stored and deloused at Majdanek before shipment to Germany for distribution to bombed-out German civilians. Clothing was also brought to Majdanek from the three Operation Reinhard camps at Sobibor, Belzec and Treblinka; there was in addition a Clothing Works in the city of Lublin where additional barracks were set up for the Jewish women who processed the clothing. As at Birkenau, there is no wall, nor even a barbed wire fence, separating the gas chambers from the clothing warehouse buildings, so there were many Jewish women working in the warehouses who were eye witnesses to everything that was going on. Besides that, the gas chamber building is only a stone's throw from the barbed wire fence which surrounds the area where once stood the first set of prisoners' barracks, called Field I, the compound which housed Russian POWs, including three Russian generals. From September 1943 to the evacuation of the camp in April 1944, Field I was the barracks for the Jewish women who worked in the nearby warehouses. According to a guidebook purchased at the visitor's center, construction of the gas chambers at Majdanek started in August 1942 and was completed in October 1942. (The first gassing of people had started in September 1941 at the Auschwitz I camp, where the first victims were Russian prisoners of war.) By October 1942, the Germans had conquered most of Europe and the Eastern front extended well into the Soviet Union; they were in the midst of their plan to get rid of all the Jews in Europe. Using the pretense of "transportation to the East," the Nazis maintained strict secrecy about the "Final Solution," even on the blueprints for the Majdanek gas chamber building, by naming the gas chambers "Entlausungsanlage," which means "delousing station" in English. The Nazis used Zyklon B, an insecticide, for gassing the Jews, the same poison they used in the camp to kill body lice on the clothing in an effort to stop typhus epidemics. A door from the shower leads into the first gas chamber which is a large room with an alcove, that resembles a three-sided room within a room. In the alcove, there are heavy blue stains left on the walls and ceiling from the Zyklon B gas used here. There are two holes in the ceiling through which the Zyklon B pellets could be dropped and openings in the wall through which hot air was blown in, according to the guidebook. This room also has a wooden floor over concrete; the walls are covered with stucco. There are two doors into this first gas chamber room, both of which open inward. Neither door has a lock on it and no marks where a lock might have been removed. Each of the doors has a glass peephole which is protected by tiny metal bars to prevent anyone on the outside of the room from breaking the glass. The glass in one of the peepholes had been broken, probably from the inside, and had not yet been replaced when I was there. The main part of the gas chamber room has a plate glass window, which lets in natural light, but it is too high up on the wall to be useful for observing the people inside. This window has no bars on either the inside or the outside. There were blue stains on the window frame and the stucco around the window. In the second gas chamber in this same building, there is a small barred window on the interior wall, about 6 by 10 inches. This window had no glass and no window frame when I took the tour. Through this window, the killing process could be observed by an SS guard standing in the small adjoining observation room, according to the tour guide. The tour proceeded very quickly through the gas chambers, as the tour guide wanted to get out of these creepy rooms as quickly as possible. There are three gas chamber rooms and a small room for observation in this building, with each room opening into the next one. The last gas chamber in this building is a small room with no heavy blue stains. 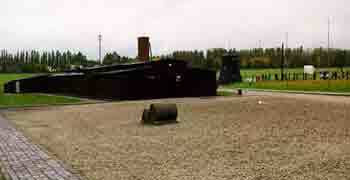 A fourth gas chamber is located in the new crematorium building at the other end of the camp. After gassing, the bodies of the victims were hauled up the slope, along the main camp road, to the crematorium in wagons drawn by tractor, according to survivor testimony. The guide book says that the engines were revved up while the victims were still in the chamber: "To drown the cries of the dying, tractor engines were run near the gas chambers." "The gas chambers were built of ceramic brick, covered with a ferro-concrete roof, and provided with a cement floor. The installation comprised three chambers: a large one (10 m x 5.5 m x 2 m) and two smaller ones (4.80 m x 3.60 x 2 m) as well as a cabin for the SS man who pumped doses of gas from steel cylinders into the chambers and watched through a small grated window (25 x 15 cm), the behavior of the victims. Two chambers, the large one and the southern smaller one, were equipped with devices for the use of carbon monoxide (CO). In the smaller one, there was a metal pipe, 40 mm in diameter, running along the walls above the floor. The gas got into the chamber through holes in the pipe. Cyclone B was poured into a special opening in the concrete roof." 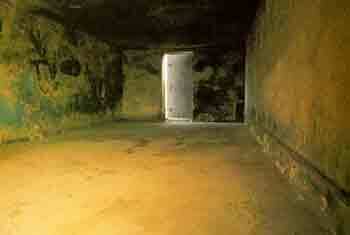 "The large chamber also had a metal pipe, 25 mm in diameter, fastened to one of the walls above the floor. As in the smaller chamber, the carbon monoxide from a steel cylinder got in through this pipe. In addition, there were two openings in the western wall, through which hot air (120 degrees C) was blown in by a ventilator from a stove placed on the outside of the chamber, which alone killed the victims and, at the same time, intensified the action of Cyclone B, since the lethal effect of the gas increased at a temperature of over 27 degrees C. The other small chamber, on the southern side, had only an opening in the roof to pour in Cyclone B. The massive metal doors to the chambers were air-tight, fastened by two bolts and iron bars."